I discovered my love of biryani in Bangladesh. Before that, I have only vague memories of rice and meat dishes, served with a dollop of anomalous ‘biryani sauce’ in Indian restaurants in Leicester. Until I went to Bangladesh and found The Real Thing, biryani left me quite unmoved. Cue my first meal out in Dhaka, at the majestic Shad Tehari Grill in Lalmatia. Shad is all about the grilled meats – fatty, charred and delicious. But it’s the biryani that earned Shad a place in my heart, and forever shaped my expectations of this glorious dish. My ultimate favourite was the chicken biryani. Wonderfully soothing, all glossy rice, cooked with gently spiced chicken on the bone, served with a boiled egg and crispy-fried onions on top, Shad’s chicken biryani was the perfect comfort when Dhaka got too much. The vegetable, beef and lamb biryanis were equally delectable. So what exactly is biryani? Biryani is a Mughal dish, made from a combination of rice and meat, vegetables, egg or fish. Traditionally, because of the varied cooking times of the ingredients, they are cooked separately and then layered into one dish. When ready the individual grains of rice should be separate, rather than smooshed together like a risotto. 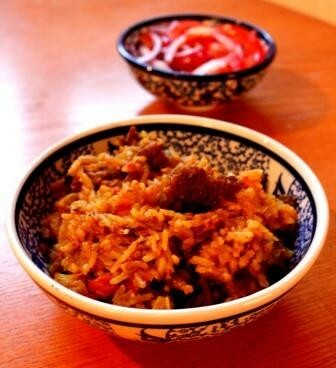 There are millions of different ways to make a biryani, but in Bangladesh kacchi biryani is the norm. It’s called ‘kacchi’ (meaning raw) because the meat, marinated in yoghurt and spices, is cooked with the rice in a pot sealed with dough. The challenge is to cook the meat just right, without overcooking the rice. Often a meat tenderizer is used – papaya being a favourite. If you can’t find papaya, I find marinating the meat for a few hours or overnight works well too. Make no mistake: biryani is a big deal. It requires lots of ingredients, various stages of preparation and careful cooking, so it’s usually served only on special occasions. I helped a friend prepare a mutton kacchi biryani for a wedding once, and I’m still astonished at how much time it took (I’m talking days here, people!). When I came back from Bangladesh, I had this great idea that I’d be cooking biryani all the time, spreading the love for it far and wide. After I realised that things that take whole days to cook don’t fit that well with a busy job and social life, I trying to perfect a quicker but equally tasty version of a kacchi biryani. The recipe below is where I’ve got to so far – it’s not perfect yet, and it’s definitely not authentic, but I think it’s getting there… But what do YOU think? Note: the meat needs marinating for at least 1.5 hours, but preferably overnight. Combine all the marinade ingredients in a bowl and place in the fridge for at least 1.5 hours. When ready, heat 2 tablespoons oil in a heavy-bottomed pan with a lid (this is really important as the biryani needs to cook for about 1 hour in its own steam). Chuck in all the whole spices (cardamoms, cloves, cinnamon stick, bay, star anise and cumin seeds), and stir until they start to splutter. Slide in the onions and fry until just turning brown. Next, add the ginger, garlic, tomatoes and ground cumin, followed by the pieces of lamb. Sautee for around 5 minutes, until the lamb begins to give up its juices. Spoon in the rest of the marinade, add 1 cup of water and simmer for about 10 minutes, until the lamb is almost cooked. After 10 minutes, tip in the rice, add 1 cup of water, stir and bring to the boil over a high heat. Once boiling, immediately move to a very low flame and cover. This is the last time you will see your biryani until it’s ready. The biryani needs to cook for about 45 minutes to 1 hour over a low flame. It’s a bit tricky to get this right, without burning the bottom of the mixture. Just keep the flame REALLY low. After 45 minutes, remove the lid and take a look. Using a fork, fluff up the rice and check the bottom of the pan. All the water should have evaporated, leaving little bubbles in the rice – if not, re-cover and cook over that really low flame for another 5-10 minutes. If all the water is gone, place a clean tea towel over the top of the pan, re-cover and leave to stand for 10-15 minutes. This is the soak up the excess moisture and make your biryani perfectly fluffy. Serve sprinkled with chopped coriander and a dollop of leftover yoghurt. Goes really well with a fresh salad, like red onion, tomato and chilli. Hmmm…. you took every care to cook it up…. nice! Really you said right, it’s tricky to cook rice just right in Dum (steam) without burning bottom. If you don’t mind me pointing out, i think tomatoes are not used there. If I am wrong, correct me. Thanks Shobhnaa! Yes, I think you’re right, tomatoes aren’t usually used in biryani. But it was scrummy anyway! Yeah right….. I can presume its scrumptiousness by its look. That was great. Much better than Jamie Oliver.